When I heard Don Johnson (DJ) speak at the World Game Protection Conference last Tuesday, I expected him to dismiss his blackjack winnings as the result of a little bit of advantage play and a lot of luck. That’s how he portrayed events in this article in Atlantic Magazine. However, after his explanation of how he beat horse racing (see this post), there was little doubt about his skill as one of the world’s top advantage players. When DJ smoothly quoted the exact house advantage of one of the blackjack games he played (0.263%), he removed all doubt. If you have not yet seen it, I recommend this video produced by Bloomberg [added 01/14]. It gives a good feeling for who Don Johnson is, as a person. Factually, it is better than most mass consumption articles on gambling, but still falls very short from giving any real explanation for what happened. DJ placed $1, 000, 000 in credit with the casino. Any time DJ lost $500, 000 in a day, he could stop playing and receive a 20% rebate on his loss. He could place a maximum wager of $100, 000. Some places, this maximum was $50, 000. In the casino-world, it is often the case that people state something “obvious” which is in no way “obvious” and is often just wrong. Such was the case in the aftermath of DJ’s slaughter. Almost everyone took it for granted that the best strategy was for DJ to play until he either won $500, 000 or lost $500, 000, then leave for the day. This “strategy” appears logically sound (if you’re not using any logic). But, strangely, it didn’t represent the actual course of events in DJ’s play. In fact, DJ played much longer on the days he was winning than this “strategy” dictated. On losing days, DJ often endured a loss of more than $500, 000. I decided to model the circumstances of DJ’s play to determine the optimal stopping points. What I found showed that DJ was right to continue playing well beyond the mythical “stopping points” of +/- $500, 000. DJ certainly played this game. He may have played against other rule-sets, but he did not disclose those. Next, I wrote a computer program that allowed me to do a Monte Carlo simulation of possible stopping strategies used by DJ. This simulation actually modeled a shoe-game that used a cut card with the rules listed above. It is a bit of arcane science, but when the dealer uses a cut card, the edge moves slightly towards the house side (the so-called “cut card effect”). 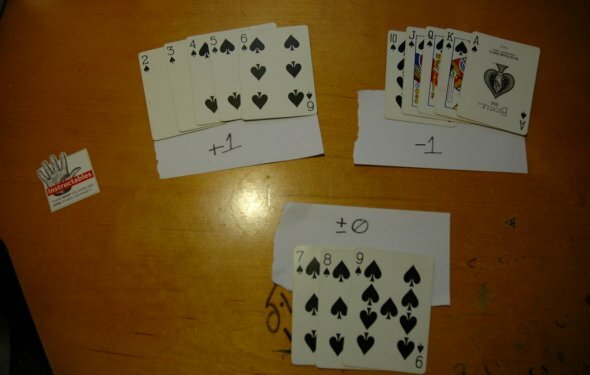 In the case of this game, the edge is about 0.29% using a cut card. For more details, I refer you to blackjack appendix 4 at the Wizard of Odds website. How to Win At BlackJack - Your Ultimate Guide! has some amazing free blackjack strategy guides. Follow those free guides and you can not Lose.